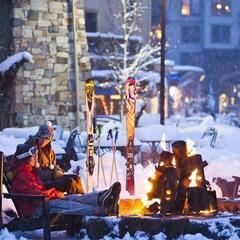 Northern California’s iconic resort, Squaw Valley / Alpine Meadows is steeped in history. Most notably, it hosted the 1960 Olympics. Luckily, for foodies and après ski junkies, the food and drink scene has come a long way since then. 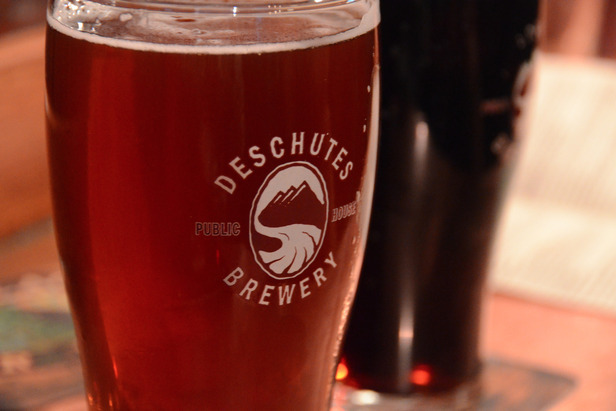 Here's a short list of locales to keep your palate entertained from sunup to sundown. Yes, you read that right. Not all Starbucks are created equal, as a matter of fact: Squaw’s on-slope installation of the iconic coffee shop is featured just for skiers. For those who couldn’t manage to swing by a coffee shop between rolling out of bed and hitting the slopes, Squaw’s new Starbucks boasts a ski-through window at the top of the funitel. Those in search of instant caffeine can either walk in to the shop or ski by the window and come away with a coffee to pound without wasting a beat in between runs and chairlift rides. 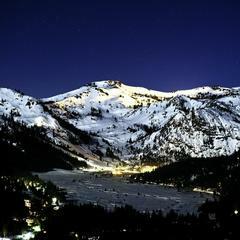 Wildflour is a Squaw Valley must on several levels. With a shop at the base in the Olympic House and another outpost at Gold Coast, this quirky, charming local bakery has been serving up the best breakfast bagels and sandwiches you can find on your way to the lifts. While you’re at it, don’t forget to buy a few of the famed, mouthwatering cookies that are an even bigger draw to Wildflour than breakfast. If they hand them over fresh and warm, which is likely, you’re going to need to eat one right away, with your breakfast, so buy a few to put in your pocket as well for a mid-morning chairlift snack. 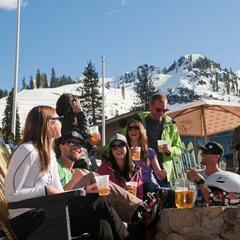 Decade after decade since it first opened its doors in 1969, Le Chamois and Loft Bar remains the go-to spot for reliving the glory of every ski day in Squaw Valley. 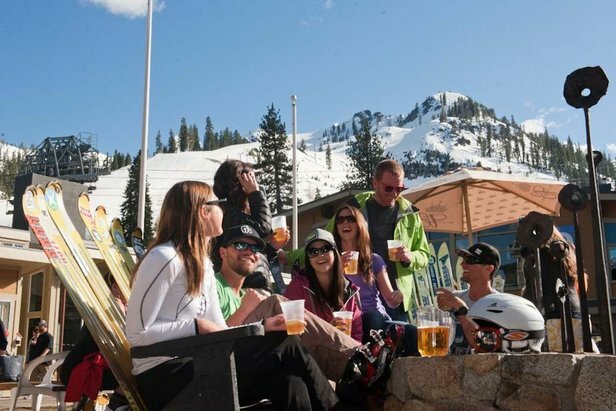 Affectionately known as the Chammy, this particular bar is the stuff of legend, where every Squaw skier you have ever heard, or will never hear of, comes to grab a beer, a slice and a little social scene to round out the ski day. Housed in an iconic, beloved little red building with a pointed roof, the Chammy, which offers just beer, wine and some typical post-ski dishes like wings, keeps things simple and focused on its glorious, classic après-ski bar vibe. 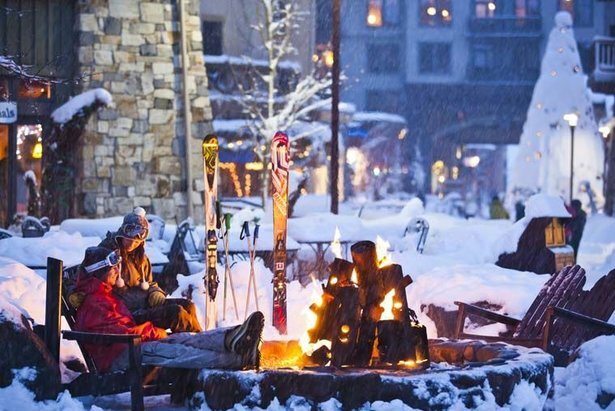 The Plumpjack Café is the dinner spot of choice for the trendy and the foodies who need a place to fuel up for the coming ski days with intimate but sophisticated ambiance and no corners cut on menu or presentation. The chefs change the menu seasonally and work in concert with the sommelier, in keeping with the Plumpjack emphasis on great wine, to present an unforgettable mountain culinary experience. The owners of Uncorked are the proprietors of five popular, sophisticated and trendy wine bars around the Tahoe area, and their passion for wine shows clearly. Uncorked in Squaw offers a wonderful place to not only hang out and enjoy a quiet, relaxing glass (ahem… bottle) of wine with friends, but also to partake in a truly enlightening oenophile experience. From behind this sleek wine bar is proffered a selection of limited production wines from around the globe, knowledgeable staff, an ever-changing list of wines by the glass, tastings and wine-centered events. The Auld Dubliner brings a bit of Irish festivity to the snowy Sierras. And by that, we mean a combination of tradition with California vibe and a fun scene that often goes strong ‘till 2 a.m. Based on the idea of a cottage pub in Ireland, the Auld Dubliner hosts live music and local bands, and the dark wooden bar fosters a cozy, raucous scene that is all too happy to partake in traditional Irish drinks and beers until the wee hours. It is possible to catch the Auld Dubliner on a quiet night, but on the right night, don’t exactly plan on being first in line for the lift the next day.